There was a time early in astronomy when scientists thought all celestial motions were perfect circles. That ended around 1600, when Johannes Kepler discovered that all orbits are really ellipses (“squashed” circles), as shown above. When planets and moons form, as ours did some 4.5 billion years ago, they are subjected to a lot of random processes. Our best current theory is that they formed from a vast rotating cloud of gas and dust. Our Sun formed from that same cloud. You can see a nice animation of the process here. Take the time to watch this short video, and the rest of what you read here will make a lot more sense. The formation process was chaotic, subject to turbulence, friction, gravitational forces, and random impacts as the planets and moons built up from the raw material in that primordial cloud. A perfectly circular orbit is virtually impossible to form under these conditions. As a result, orbits have elliptical shapes. We measure this elliptical shape with a number called eccentricity (e). If e = 0, you have a circle. If e = 1, you have an ellipse so “squashed” that it’s a straight line. All real orbits have eccentricities between 0 and 1 (0 < e < 1). The graphic shows the correct shape of several orbits (not to the correct size scale). The Moon’s orbit has e = 0.055, pretty close to a perfect circle, but enough of a difference to create the Super Moon effect. Planet Mercury has a fairly eccentric orbit, with e = 0.206 (the highest of all the planets). Comets can have extremely eccentric orbits. 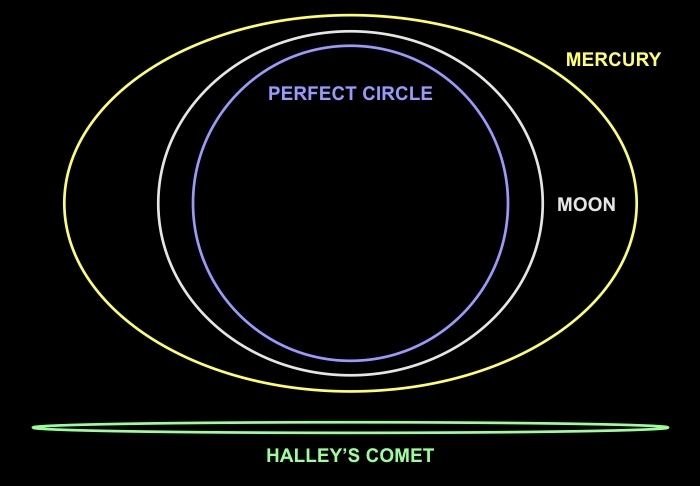 Halley’s Comet has e = 0.967 (pretty close to 1). Look at the differences in those orbit shapes. So that’s why we occasionally get a Super Moon. When the Moon is closer to Earth, it naturally appears larger. In closing, I should mention that the orbits of the major planets (Mercury excepted) are all nearly circular. The recent reclassification of Pluto as a dwarf planet was due, in part, to its high orbital eccentricity of e = 0.25. NOTE: Last week I promised to share my photographic results from the Venus transit. It’s a nice time-lapse video of Venus crossing over the edge of the Sun. You can watch that video on our astronomy club website here (scroll down).